Motherhood is one of the most wonderful things that ever happened to me. I never thought that I would be able to experience it a few months into married life but as they say, the best things happen when you least expect them. Although I was not quite prepared for it, I knew then that I will learn from instinct, from my experience with my mom, and from other mommies who have been there and done that. I am blessed to have known a person whom I consider my mentor when it comes to parenting, Marce Chris of The Mommy Journey. She may not know it but I always find her posts on parenting comforting and enlightening. I look up to her because she is a God-fearing person and she sees to it that she is able to nurture her children's talents by exposing them to various art forms and even sets a date for Art Day. And because this blog is one of my role models on parenting, I have also based some of my little one's activities from it. I also enjoy participating in her Friday meme, Mommy Moments where I get to brag about my child and share my experiences as a mom and learn from other moms as well. 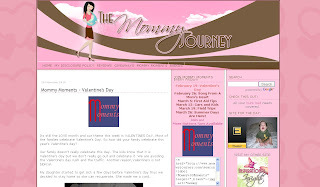 The blog layout is three-column with pink and white backgrounds, very fitting colors for a parenting/mommy blog. I love how the elements are arranged in the sidebars... in the order of their importance. If you are Mom or even a Dad, there's definitely a lot of useful stuff to be found in this blog. And if you still haven't connected with her, then please do so. You can grab the badge, join the meme, subscribe to The Mommy Journey feeds or follow it on GFC. Or better yet, do all four! i also bookmark Mom Chris' art day entries...malapit ko na yang magamit.